Once a meeting has been added, you are asked to choose the attendees and to prepare your meeting agenda item by item. The items can be reorganized by a simple drag and drop and they are automatically numbered. Indent, modify or delete an item. Add notes: notes allow you to list the information. Add decisions: decisions made during a meeting are clearly visible in the meeting minutes. Add tasks: tasks can be linked to precise items of the agenda meeting. Attach files: each item can have one or several files. Presenter: your meeting agenda is a common thread for the chair of the meeting. Synchronization of the calendar : once the meeting agenda is prepared, an event will synchronize itself in the agenda of the attendees (compatible with Outlook, Google Calendar, etc). During a meeting, you will find your meeting agenda item by item with its notes, attached files and linked tasks. You can then draft one or several paragraphs in each item with the notes system, show the decisions that were made and list the tasks to do for the next meeting. The meeting agenda serves as a guide to help you structure your meeting and control the duration of the meeting. 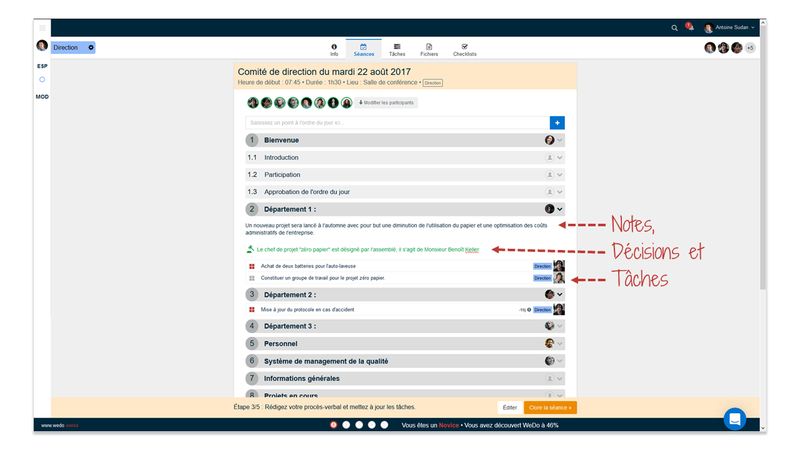 Modification of deadlines and comments on the tasks are also automatically traced by WeDo to be included in the meeting minutes. 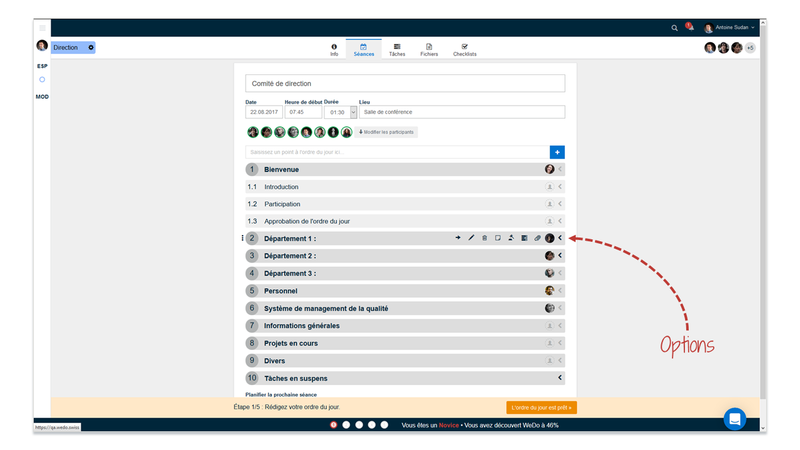 At the end of a meeting, the meeting minutes are accessible to all the attendees and each collaborator will automatically receive the tasks that have been assigned to him in his personal space. Tasks that were completed between two meetings will automatically appear as completed in the following meeting. The task history allows you to visualize all the modifications brought to each task with a link towards the corresponding meeting minutes. In short, WeDo offers a complete traceability of the tasks throughout meetings. When you create a new meeting, the information of the previous meeting minutes is reused to save you time and avoid having to copy-paste and the risk of mistakes. WeDo’s search tool indexes the text of all your meeting minutes through all the workspaces of your network. Simply enter one or several keywords to instantly find a specific file. All meeting minutes can be locked after being reviewed to ensure the traceability and reliability of your archives. A single click will allow you to export your meeting agenda and meeting minutes as PDF files. The export module will allow you to select the information you want to keep in the file. This is very practical to generate extracts of the meeting minutes. This new version of the meeting module allows you to save time and money. Customers who use this module successfully have confirmed saving up to one hour per meeting because the meeting minutes are drafted during the meeting and not afterwards. They have also noticed that their meetings are approximatively 30% shorter than before. Meetings are better prepared, better focused and thus more effective. They have also noticed a time saving when it comes to decision-making and task management. We were able to integrate all the suggestions for improvement from our customers in this latest version. Hence, we would like to thank them for their helpful advice and comments. WeDo will continue to evolve to become a complete collaborative tool, intended primarily for Swiss companies. Find out how to turn your emails into tasks by transferring them to WeDo. The new version of WeDo allows you to visualize the decisions that were made during a meeting in the activity feed. The new version of WeDo integrates various new features such as rights management during meetings.